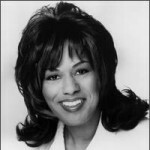 October 19, 1960 Jennifer-Yvette Holliday, singer and actress, was born in Riverside, Texas. At the age of 19, Holliday earned a role in the Broadway production of “Your Arm’s Too Short to Box with God”. In 1981, she originated the role of Effie in the Broadway production of “Dreamgirls” and remained with the show for nearly four years.That role earned her the 1982 Tony Award for Best Lead Actress in a Musical and her recording of “And I Am Telling You I’m Not Going” from the show won the 1983 Grammy Award for Best Female Performance, Rhythm & Blues. Holliday went on to record such hits as “I Am Love” (1983), “No Frills Love” (1985), “I’m On Your Side” (1991), and “A Woman’s Got the Power” (2000). In 2000, Holliday received an honorary Doctor of Music degree from Berklee College of Music.